Admin dashboards are significantly important part of any web application based sites and the membership websites. Mostly the users of the admin dashboard are not aware of what’s happening behind the screen. What most user care is the what they see and what they can access. 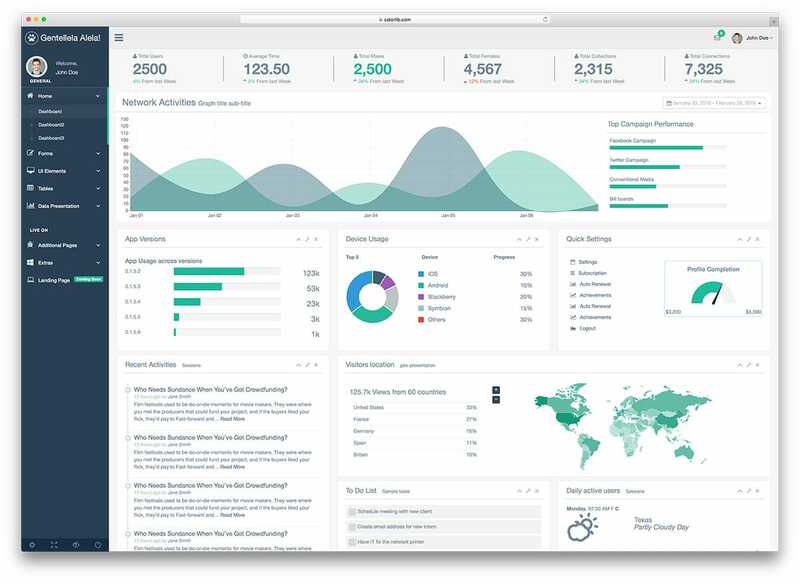 These best free admin dashboards in this list will help you create an effective dashboard. 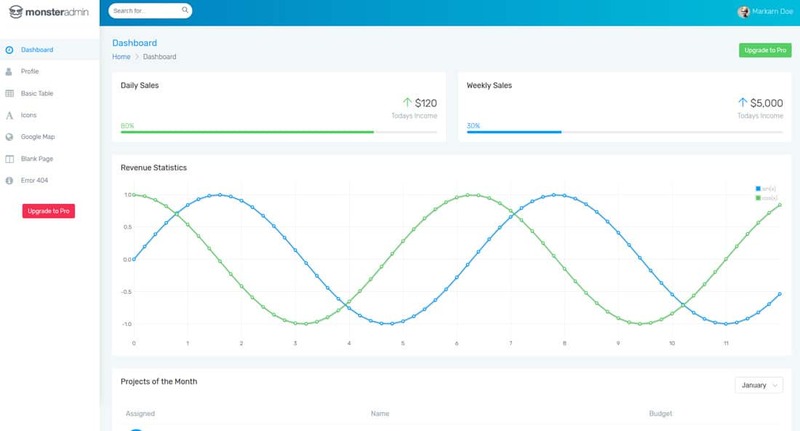 If you are a developer looking to create an awesome on-trend admin dashboard then this list will help you get great inspirations. Some of the admin dashboards give you the option to customize the dashboard. But when you are developing for the user is it important to provide a customizable dashboard? The answer depends on the customization options that you are going to give. Options to drag and arrange the blocks, changing the colors, dismissible notices all are fine. But providing a completely customizable dashboard is not a must. Because it takes time and resources to create such a customizable dashboard. Before going to design or develop your dashboard make sure what are all the options you need. The next important thing is to understand your user. Always try to develop any design by keeping the user at the center. Brand consistency is another major factor which we mostly forget. We develop sites and customize it to make it reflect your brand, in your dashboard also maintain the same brand consistency. 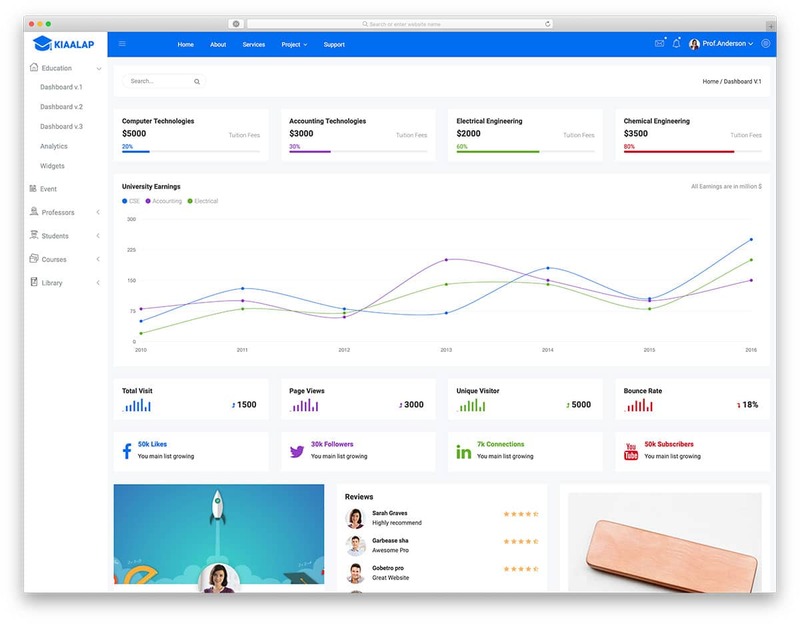 Jan Losert has given awesome pieces of advice on creating an effective dashboard design take a look at it to know more. In this free admin dashboard list, we managed to collect dashboard design of all kinds. Some are even customizable, based on your needs select the one for you. Now let’s get into the list. Concept is a multipurpose admin dashboard template. 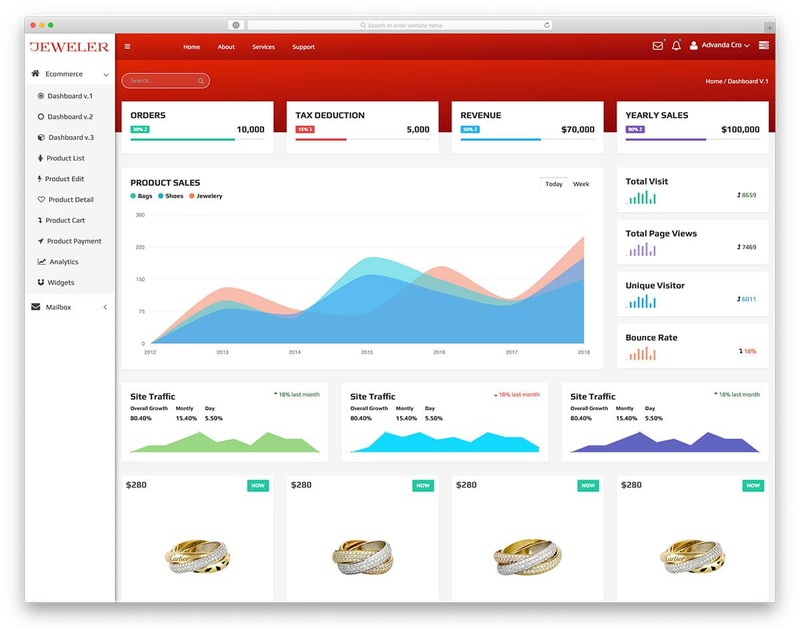 The creator of this dashboard has given you all the options and features you need to create a proper dashboard. Colorful charts and beautiful icons help you to visualize the stats value beautifully. Animation and visual effects are also used to give better user experience when the user interacts with the charts and tables. Apart from the main dashboard, you also get other pages and widgets pre-designed for you. For example, you get a separate login-form page pre-designed for you. Smooth animation and fluid transition effects make this dashboard snappier and will improve the user’s productivity rate. Adminator is a premium feel admin dashboard. 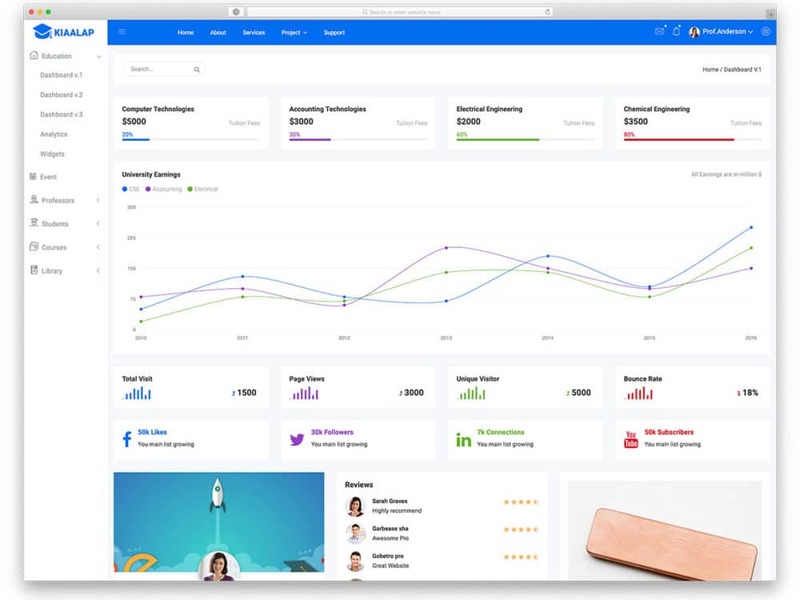 The clean design and elegant look of the template will make the people raise their eyebrows when you say it is a free admin dashboard template. It has all the features you need in a dashboard, some of the features of this template are rare to see even in a premium dashboard template. For example, the animated icons and the quick chat feature. The developers have not only spent their time in making this template look elegant but also put equal effort to provide you many useful features. With this premium quality admin template you get features like calendar, chat, charts, UI elements, forms, multiple levels, maps and the list goes on. It is better you take a look at this template to know more about the features, I will drop the link below. 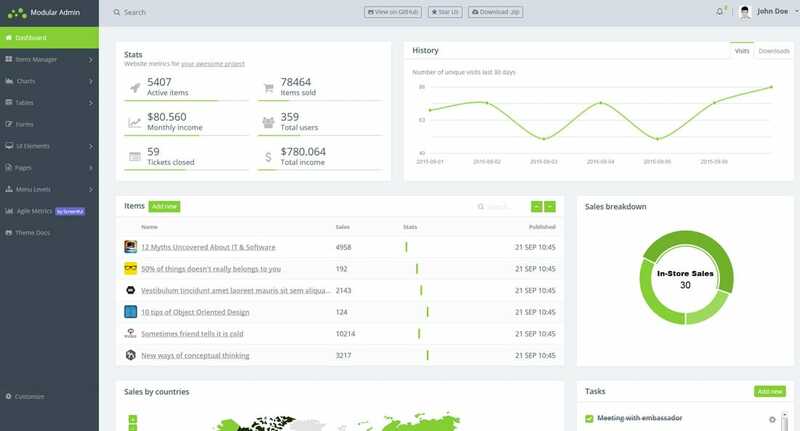 Kiaalap is a material style admin dashboard template. From the Android Pie release, Google has revamped the look of the material design for more fluid user experience across all devices. The designer of this template has used the updated design and it looks awesome. Visual effects and animation effects are used to present the contents engagingly to the users. The navigation sidebar can be minimized if needed. Shrinking and expanding animation of the sidebar is sleek and quick. Icons are used smartly to show the options in the shrunken sidebar. In the top bar account, links and application links are used. If you are planning to use this template for a web application, this navigation structure will help the user to find related contents easily. Chat tool is also integrated into this template, if the user has an issue, they can reach you directly. Tawkto chat tool is used, which is an effective free chat tool, all you have to do is to complete the setup process to make it work. Elements wise also this template gives you all the basic elements to set up a proper dashboard. Srtdash is the best admin template for financial websites and software products related to the financial industry. Your users can easily maintain their financial accounts and also can keep track of their activities. The creator of this template has designed this template based on the cryptocurrency concept, but this template can also be used for the stock market-related business as well. As most of the modern stock market volumes are maintained by the bots, providing an easy to access the dashboard to your users will help them tremendously. From the dashboard, the users can see the livestock value and their values. Charts and graphs are used to visualize the contents so that the user can understand the content on the go. The navigation links are split between the two sidebars; dashboard links are given in the left sidebar and account setting are given in the right sidebar. All the elements are functional from the front-end, you have to manually take care of the backend process. To make use of the entire screen space, this template gives a fullscreen option. Jeweler dashboard template is the best option for the e-commerce website and fashion store website admins. Clearly understanding your sales chart will help you plan a fail-proof business strategy. This template gives you a complete overview of your sales, orders, revenue, and net profit. The designer of this template has given you three dashboard variation with different chart elements, based on your need you can set the one you like. A big calendar element is also given in this dashboard template to help you neatly organize your daily schedule, shipment date, and inventory refill dates. Mostly font awesome icons are used in this template, in which you have plenty of well-optimized icon options. As this template is designed for the eCommerce store, most of the elements included in this are related to online stores. Other regular elements like charts, bars, and forms are also included in this template. Visual effects and lightboxes are used to show more contents without crowding the screen space. As major computer operating systems, Mac and Windows are now supporting dark mode, software manufacturers are making use of the dark mode. The biggest advantage of the dark mode is you can clearly see the contents and the details. 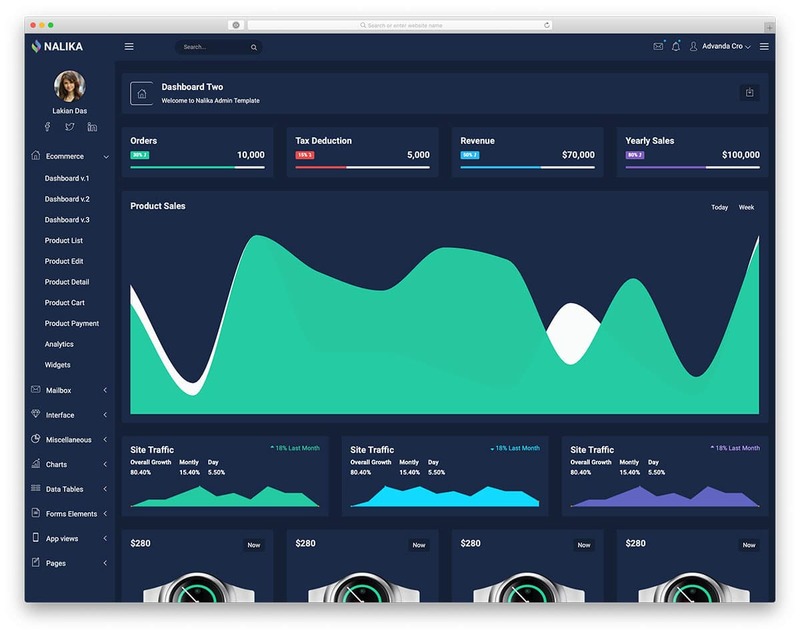 Nalika is a dark mode dashboard template for the online stores. This template is similar to the Jeweler template mentioned above since both the template are from the same designer you can see some design similarities. But, this template is designed for users than the website admin. If you are planning to start a community for online shoppers, just like the Amazon Spark, this dashboard will help them manage the user account. As famous social media widgets are pre-bundled in this template, the user can easily share the content from the dashboard itself. This template also includes many business elements, so based on your needs you have to pick your elements. As said before, in the dark mode the colorful charts look more vibrant and easily notable. Life of a digital marketer is not an easy one, we have to keep tabs on multiple channels at the same time. Thankfully there are plenty of online marketing tools to streamline your workflow. But, still having everything under a hood will save much of your time. 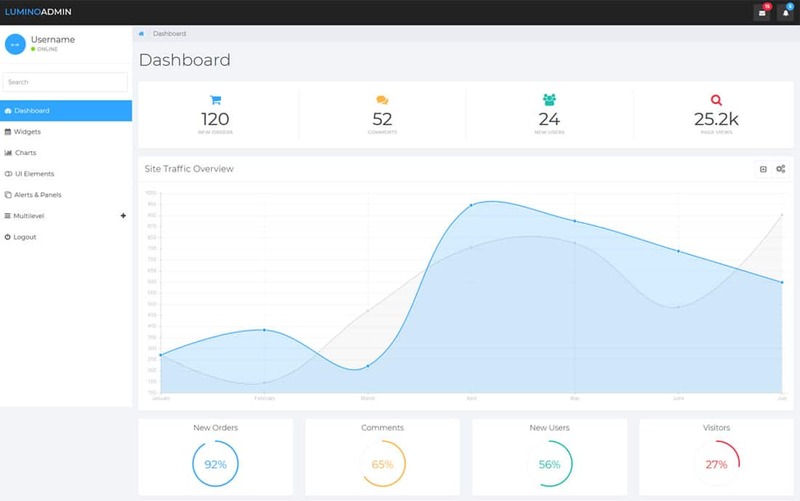 The Octopus is the best dashboard template, that gives you all the options in one place. Live charts and animated web elements are also included in this template to keep you updated about the latest trend and your goal. This template gives more importance to the dashboard elements than the texts in the dashboard. Each widget has its own settings options and minimizing options. So you can concentrate on the task that matters the most to you. Even when you are integrating a tool or a widget to the template, this design will help you make use of the entire option effectively. All the navigation options are given in the left sidebar and upcoming event tasks on the right sidebar. You get all the basic chart and element options in this template, so this one is developer friendly as well. Notika dashboard template is almost similar to the Kiaalap template mentioned above, but it has its own elements. With the simple clean design, the user can easily find the content and organize their work. Instead of following a sidebar navigation design, this template follows a tabbed interface. Under the tabs, you can all the elements and categories you want. Trendy smart icons are used for the elements to elegantly display the options. It is a mobile-optimized template so the users can manage their account on the go. The template uses the latest HTML5, CSS3, and Bootstrap framework so you can expect a smooth performance from this template. With this template also you have the Tawkto chat tool built into it; once the setup process is over, you can use it straight away. Adminpro is a must have template collection for every web developers. The creator of this template has given you plenty of variations and features for free. Mostly you can find these options and variations in the premium template alone, but here you get it for free. With this template, you get seven admin template variations. Each variation has its own unique design and dashboard elements. As you expect in all modern template, this one is also mobile responsive and performance optimized. The flexible code structure of the template makes this template easy to customize and also to integrate with your existing project. If you are a busy website admin, who always wants to keep a tab on many things simultaneously then Sufee is the best choice for you. The intuitive design of the template helps you to follow profile activities all four famous social media namely Facebook, Twitter, Linkedin, and Google plus. You also have the option to overview your site traffic details on the homepage. 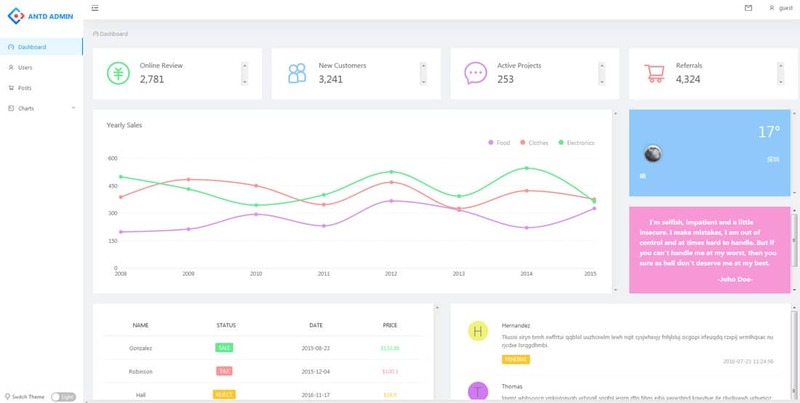 Overall the Suffee is a best free admin dashboard for solopreneurs who own websites and for business webiste templates. The flat design of the template helps you to visualize more stats and values in an interactive way. UI elements you get with this dashboard template is call to action buttons, badges, tabs, tables, and forms. This template also provides you plenty of chart variations to help you see data in your most preferred form. 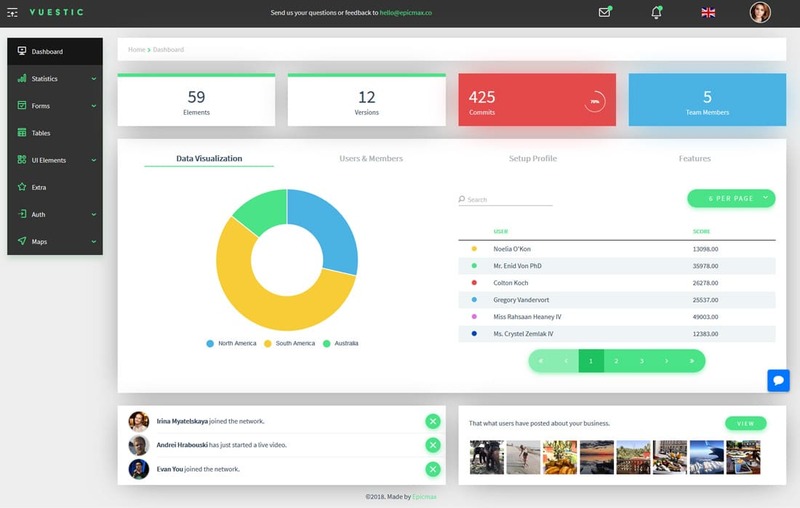 Gentelella is a professional admin dashboard template. This dashboard follows a text rich, content-focused design. But it doesn’t mean that this template lack visual elements. Gentelella also has modern web elements to provide the web stats elegantly to the admins. The to-do list block at the bottom helps the user to stay on track and also helps them to focus on the nest most important thing. The small icons and bold texts are used in right proportion. Even if you are in a hurry you can see the important stats at a glance. Other useful features you get with this template are recent activities and task completion indicator. The sidebar can be collapsed to get a better view of your dashboard. With this free admin dashboard, you get web elements, forms, charts, layouts and multiple level menus. Metis is a bold retro style dashboard template. It does not have any modern visually well-polished web elements, but it has all the features you need in an effective dashboard. The unique feature of this free admin dashboard is the style switcher. The style switcher gives you the option to customize certain looks of the template. For example, you can change the background color of the dashboard and the font color. Metis give you nine background colors to choose from, even if you messed up with the look, you can easily switch the look with a click of the reset button. The fully stretched calendar give you ample amount of space to preplan your work and also helps you to organize your work accordingly. Feature wise you get all the UI element options, chart variations and maps you get in all the free admin dashboards mentioned above. ANTD admin is another premium feel admin dashboard you get for free. 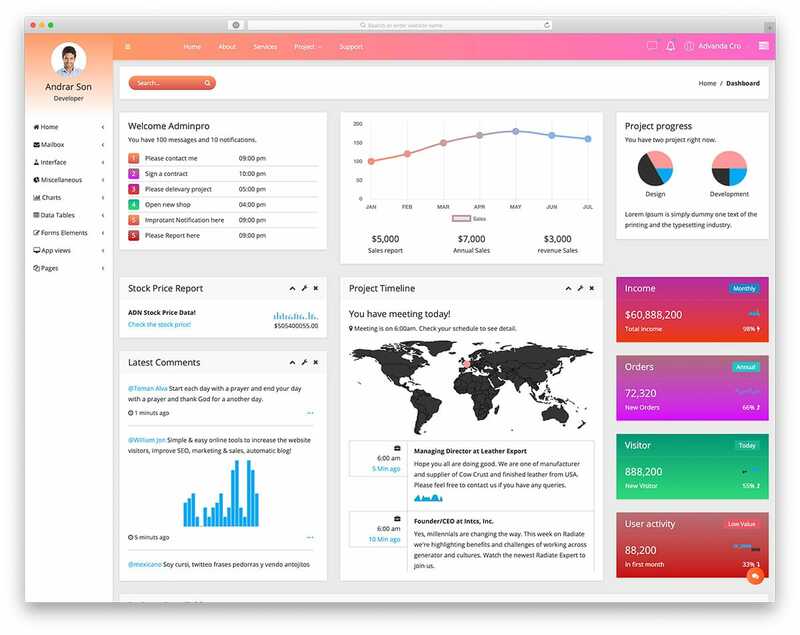 It is an ultra-modern admin dashboard with trendy colors. The right amount of spacing between each block gives a clean look to this admin dashboard. 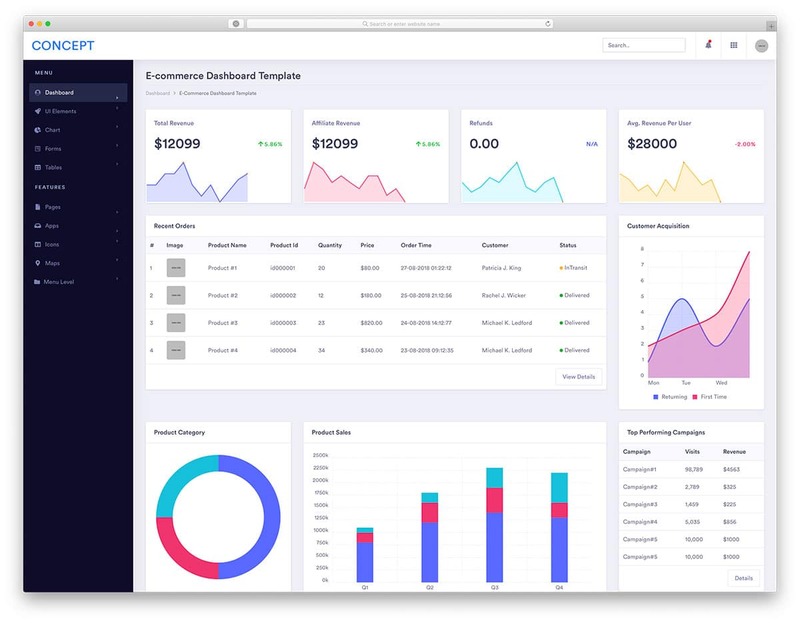 By default, this admin dashboard best suits for ecommerce website templates. All the web elements provided are given by keeping an online store in mind. But you have the option to customize these features. Monarch is not a free admin dashboard, but worth to take a look. 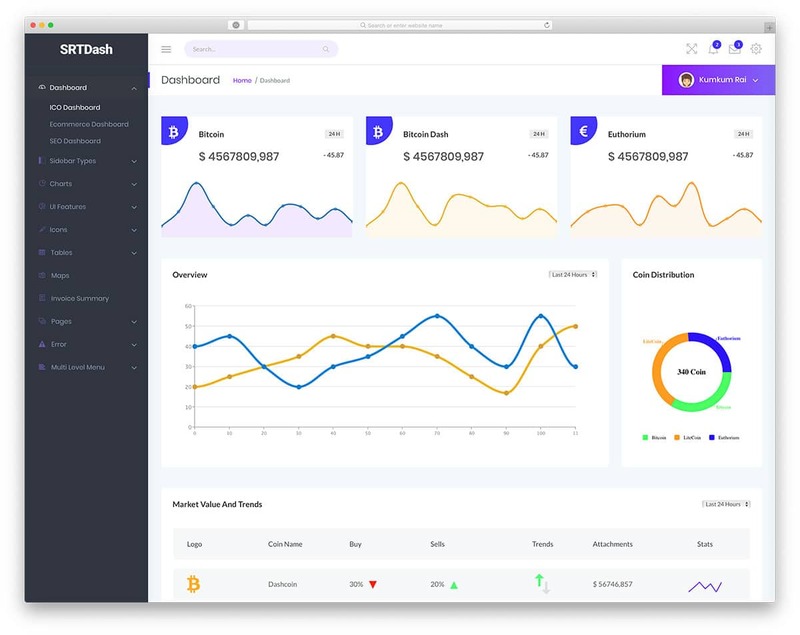 With the Monarch, you get a collection of dashboard developed on different platforms like Angularjs, HTML and Bootstrap 4. 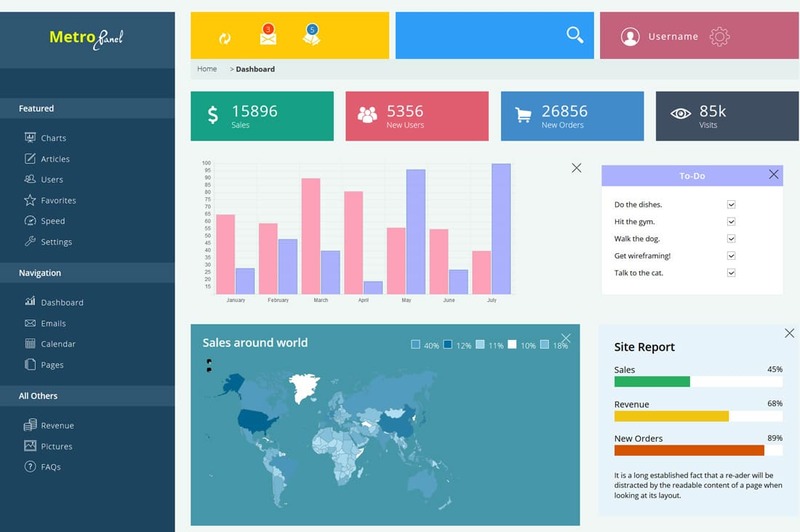 You also get an HTML website template along with this admin dashboard collection. Coming to the design part the template follows a modern and trendy look. It is quite an opposite to the Metis dashboard mentioned above. The clean design of the dashboard helps you to visualize even large volume of stats without any difficulty. Instead of using a solid color this template uses a cool gradient. If you are not a fan of gradient colors don’t worry, Monarch dashboard gives you the option to change the colors to solid colors. With gradient colors also you get different color options. The use of trendy line icons combined with modern colors and cool visual effects gives this template a unique look. Vali is a simple and bold looking admin dashboard. This admin dashboard suits for people who love to see only important data on their screen. It is super simple and clean with the limited amount of blocks. Since only a few data are shown in the dashboard, the blocks are big and manage to utilize the full-width design. Visual effects on this template are clean and you can see the stats easily by hovering over the charts. The elements you get with this free admin dashboards are; cards, Bootstrap elements, widgets, six variations of charts, tables, and forms. Charts are the only elements that use animation effects in this template. If you are not interested in animated charts then you can change it with few lines of codes. Vuestic, as the name implies this template is built with the Vue js. If you are a developer you might be knowing how flexible the Vue JS is, its the same case with this admin dashboard also. The Vuestic admin dashboard is clean and flexible. Use of drop shadow effect to distinguish the blocks from the dashboard background is a well-thought design idea. The shadow effects give a three-dimensional feel to the users. By default, this template is designed for the event website templates, it shows the stats of users, profiles, commits, and signups. You can customize it easily based on your needs. The charts are also designed well to help you show different data distinctively. 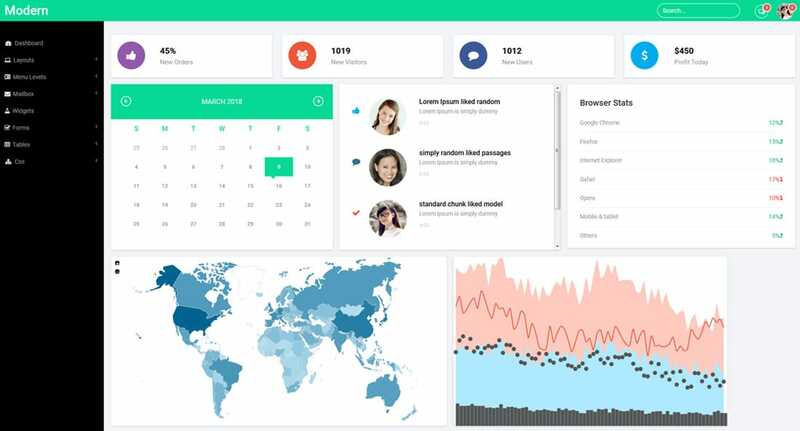 Overall a professional looking dashboard which offers almost all the web elements similar to other free admin dashboards mentioned in this list. 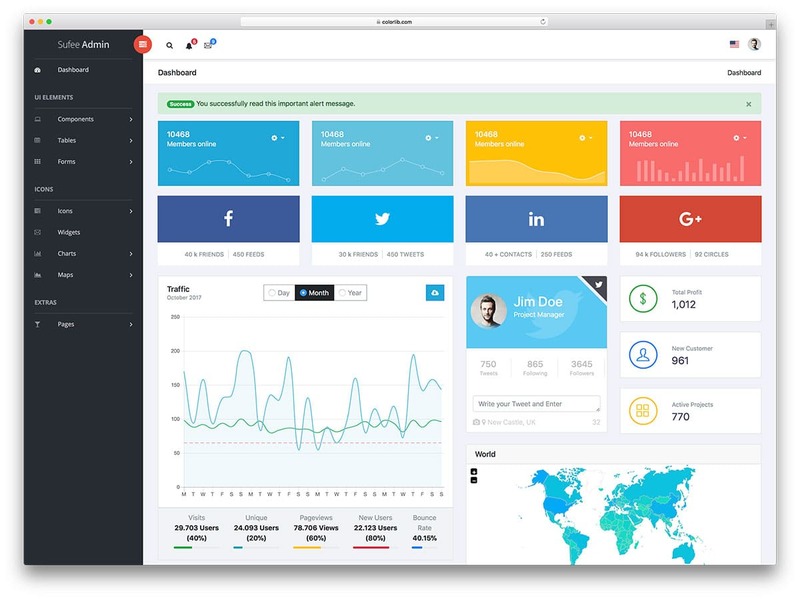 Lumino is a freemium style admin dashboard. 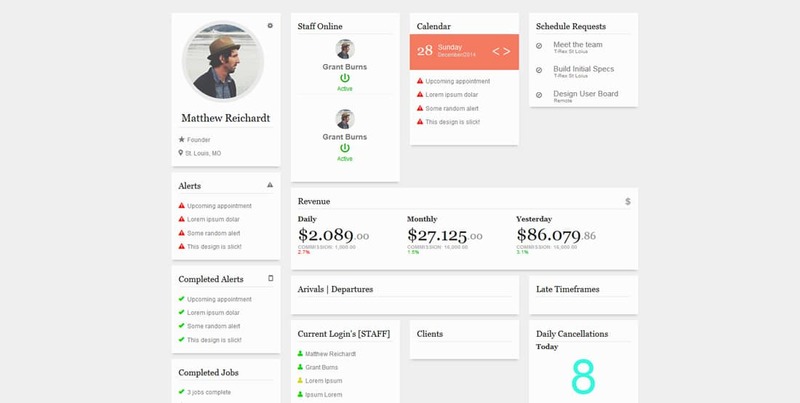 There are both free and premium dashboard options available with this template. The features you get with the premium version are different color schemes, different types of charts and pagination. In the free version, you only get the default options and you cannot customize them. Based on your need select the version you like. Coming to the design part this template is clean and professional looking. It uses a clean white background and professional light blue color as the color scheme. Each block in the admin dashboard is big enough to show you all the important detail neatly. The tradeoff for this big blocks is you can’t add many blocks. The best features are to-do list and right from the dashboard itself you can chat with other users. Since it is a freemium model template you get plenty of dashboard elements with restricted access in the free version. Below I have added the demo link for the free version of the Lumino admin dashboard. 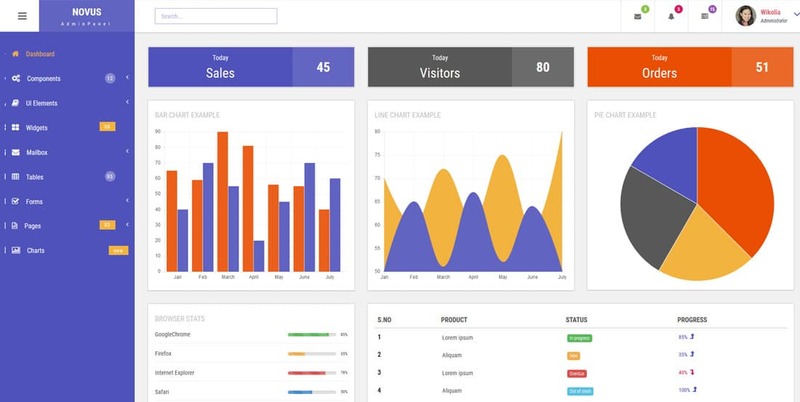 Bootstrap 4 as the name implies this free admin dashboard is developed with the bootstrap. It is also a freemium style dashboard template just like the Lumino mentioned above. 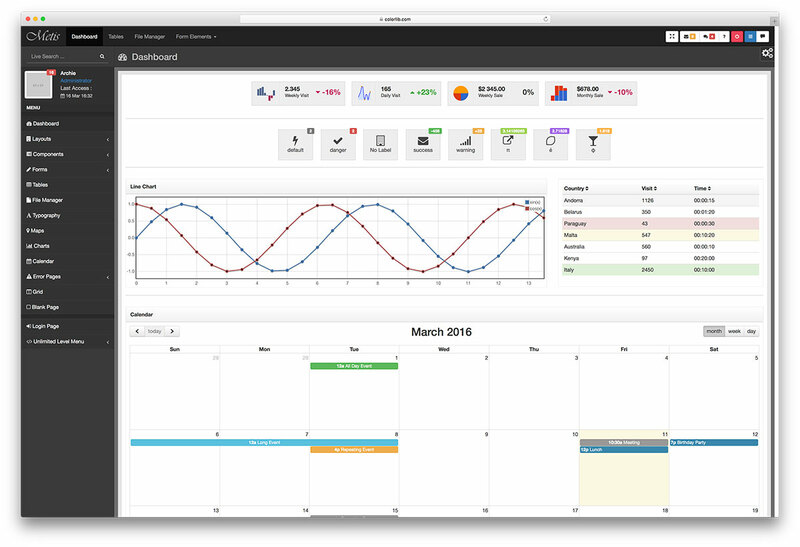 In the pro version, you have the option to customize the color scheme and have different variations of charts. Since this dashboard uses the latest version of the Bootstrap you get all modern web elements with this template. This well-coded template is easy to use and customize. The dashboard follows a smart design layout which gives you ample amount of space to add as many elements as you want. By default in the dashboard, you have a chart, to-do list, timeline, calendar and user profile. All these setups are best for site editors, who need to manage a number of writers and articles. Novus is the most colorful free admin dashboard on this list. With full of modern material colors, you can easily distinguish each element on this template. The Novus follows a structured design, hence all the blocks and elements in the dashboard are in proper order. By default, this template feels like a more refined modern version of the Google analytics dashboard. The primary color scheme of this template is violet and the yellow, which looks vibrant but at the same time retains the professional look. You also have the option to hide the side navigation bar in one click. Since the template uses a hamburger style menu bar the users get a similar interface in both the desktop and mobile devices. And yes, this template is mobile optimized out of the box. 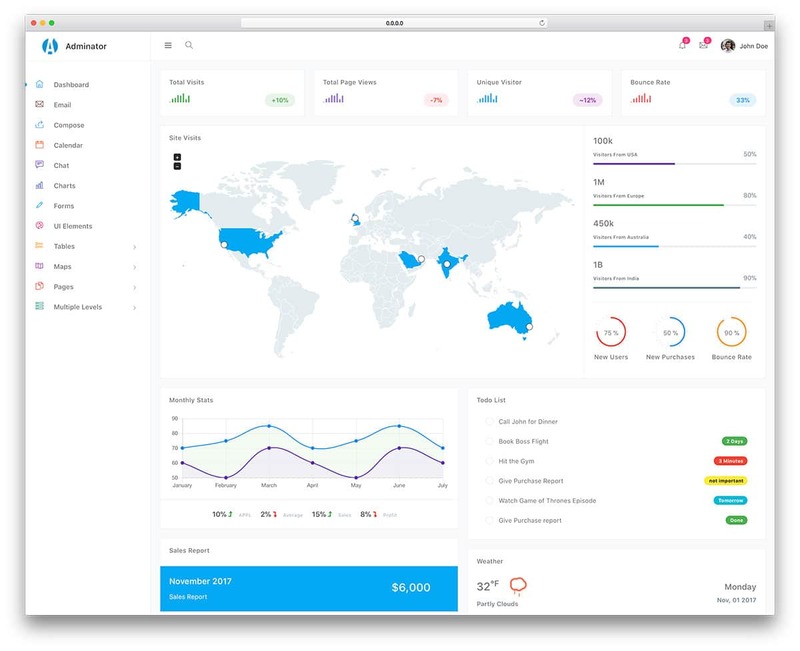 The Modern admin panel is a contemporary style admin dashboard. The default options you see in the demo version best suits for the websites providing online services or selling online goods. With the full-width design, you have plenty of places to add more web elements and charts. The sticky sidebar gives users a better navigation option. At the top right corner, you have the profile icon and the chat icon. Instead of providing a separate option for notification, the profile icon itself acts as a notification indicator. The animation effects on the chart are minimal and clearly shows appropriate data when the user hovers over the chart. 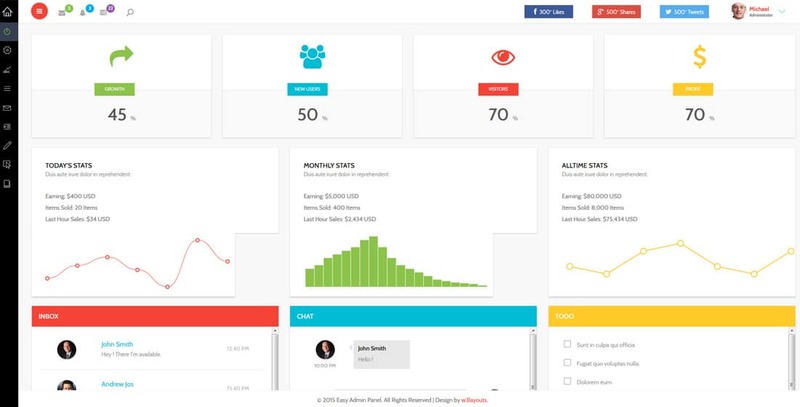 The Easy admin panel is a grid style free admin dashboard. When I say grid style, don’t think it follows a classic style. This template uses modern design with all the web elements and the dashboard options neatly arranged. In the top bar, you have notifications, emails, task manager, and the social media followers count. Each dashboard elements use different colors so the user can clearly identify which category they are viewing even if they are in a hurry. Productivity options you get with this template is chat options and the to-do list. With this template, you get working dashboard elements and options. You can use these elements to customize the template if you need. Monster Admin Lite is also a freemium style admin template. But the features you get in this free version is a bit higher than the other freemium style admin dashboards mentioned on this list. With the full-width design, you get plenty of space to add more dashboard elements. 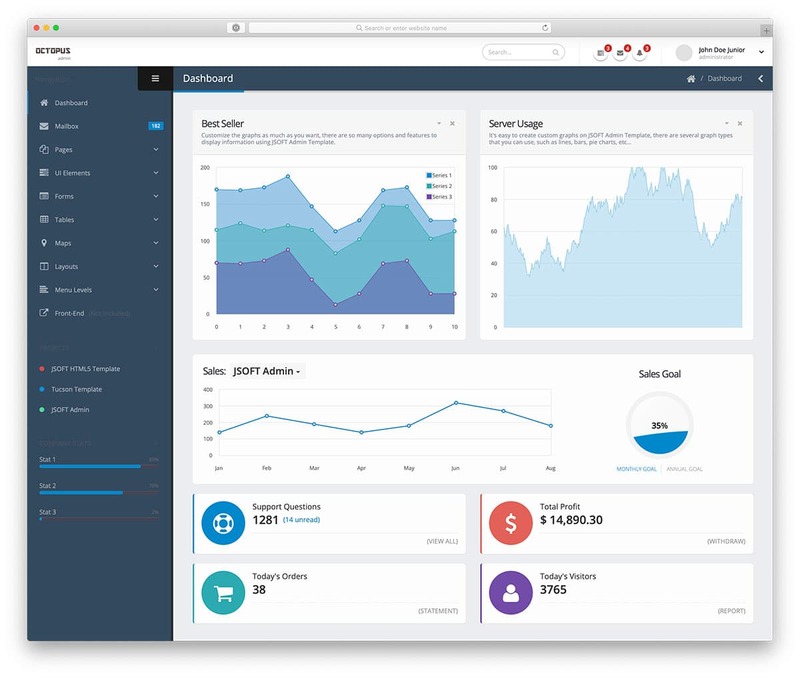 The default design of the admin dashboard is focused on the conversions and the revenue of the site. At the bottom, you have the options to add recent posts from your site. The best part of this admin dashboard is you have the option to add project list. At a glance you can see all your project lineups for each month, you also have the option to filter the months. Modular admin is a pure HTML admin template. It is one of the free admin dashboards that give you the option to customize the look of the dashboard. The Modular admin allows you to change the color scheme of the template. As of now, you have the option to choose from six available colors scheme. Another customization feature you get with this free admin dashboard is to make the header, footer and the sidebar sticky. At the top right corner, you have the option to include the profile settings and notifications. To the top left corner, you have the search option. The admin dashboard blocks are designed with ample amount of spacing between each block. Fonts used are also are big and easy to read. 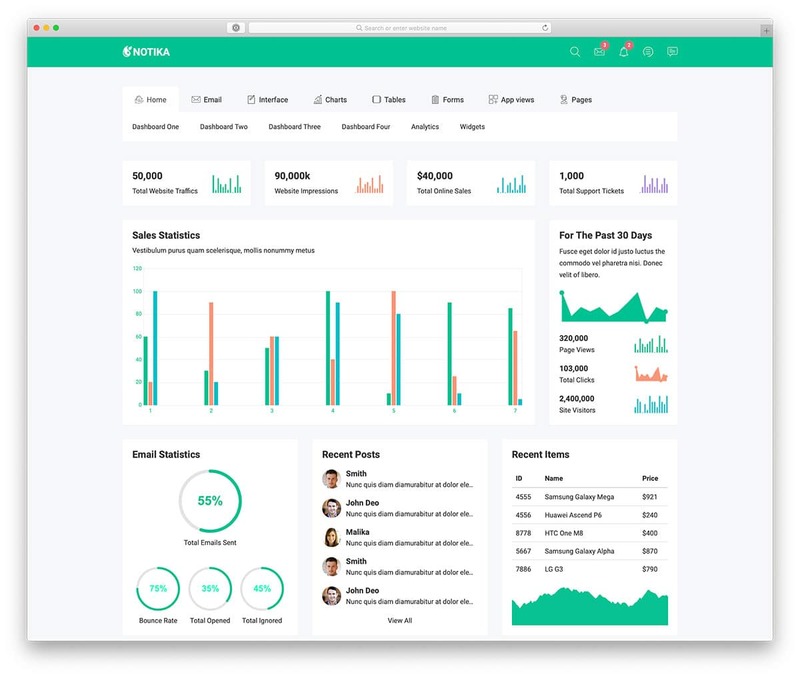 Keen is more than just an admin dashboard. It is a developer kit with plenty of useful codes. 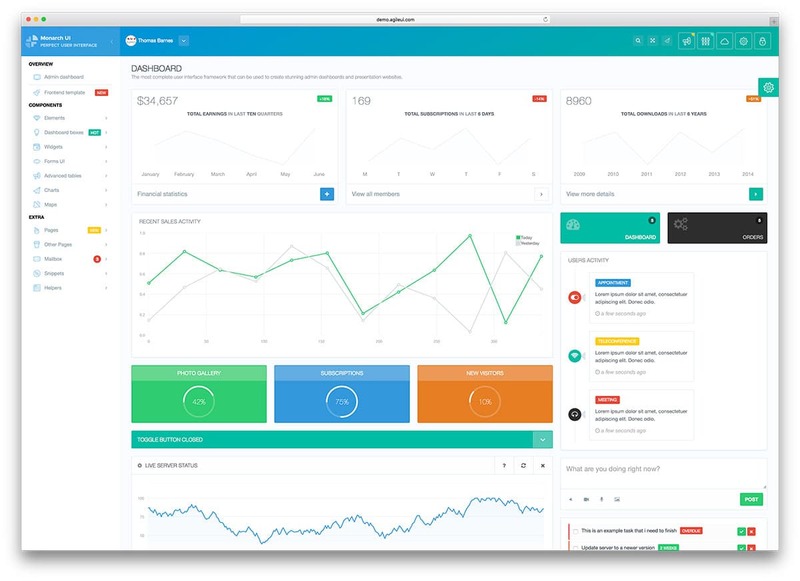 In this kit you get four different admin dashboards, each dashboard follows different concept. Since you get dashboard elements that serve different purposes. The Only drawback with this template is it is a starter kit, hence you don’t get any jaw-dropping designs and cool effects. But you can use this template to learn more about the dashboard elements and how to combine with different functions. Overall the Keen is the best package for new users and beginners. 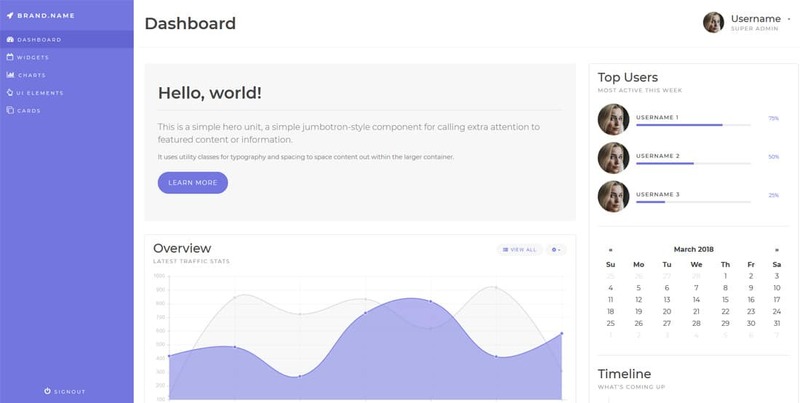 Metro Panel is a flat style admin dashboard. With big content blocks and bold texts, this template manages to make use of the full-screen design. The unique feature of this admin dashboard is you have the option to dismiss the cards on the dashboard. So when you are done with a block you can clear it and can concentrate on rest of the tasks in front of you. By default in the demo, you have charts, todo list, your site performance stats, calendar, and blog post options. The metro panel gives you only limited amount of options and features. If you are looking for a simple dashboard to show less amount of data then this template would do. The dashboard page is the only dark-skinned admin dashboard on this list. Dark theme lovers, this admin dashboard is for you. The reason am mentioning this admin dashboard almost at the last is you can only use this template as an inspiration. Charts and other stats options are not in full working condition. You don’t have the hover effects to show the exact value as you have seen in many of the free admin dashboards mentioned above. The coding used to create this awesome looking dark skin admin dashboard is shared by the developer Icebob. You can use this as a base and can create your own custom admin panels from scratch. Boxly is a floating style admin dashboard. To make the web elements and other admin features to stay in order the developer has followed a boxed width style. For navigation this admin dashboard uses a classic top bar navigation, it makes this template stand unique from the rest of the sidebar navigation style dashboards. Drop shadows are used in order to make the admin block elements stand out from the background in this floating design. These are some of the best free admin dashboards you can make use of for your sites and projects. Some of the free admin dashboards like Adminator will give you plenty of elements and customization options that you get in a premium template. Each dashboard follows a different style, so based on your needs select the best template.